Beautiful and comfortable mountain property with sea views! Foldaway queen-size bed, sofa-bed, cupboard, sideboard, table and 4 chairs, ceiling fan and mobile fan. Space designed for maximum 2 + 2 occupants. Prices (see the calendar for availability and prices) ranging from $ in low season, from April 15th to December 14th, at $ 75, in high season, from December 15th to April 14th. Supplement of $ 5 / hp exceeding 2 people. Supplement $ 7 / ch for Friday and Saturday if stay less than 7 days. Weekly charges to be paid to the attendant: CLEANING: room and bathroom $ 10. Personal laundry, optional. to negotiate with the attendant. bar, fridge *, stove *, tableware *, BBQ. C_Free parking with electric gate. D _ Perimeter surveillance by cameras. QUINTA SOLYMAR, BnB, your pied-à-terre in Costa Rica! _ First of all, Quinta SOLYMAR is a magnificent property located in altitude, overlooking the sea. It allows us to enjoy throughout the day a refreshing breeze of the mountain. Each room has a ceiling fan and a mobile fan for comfort. 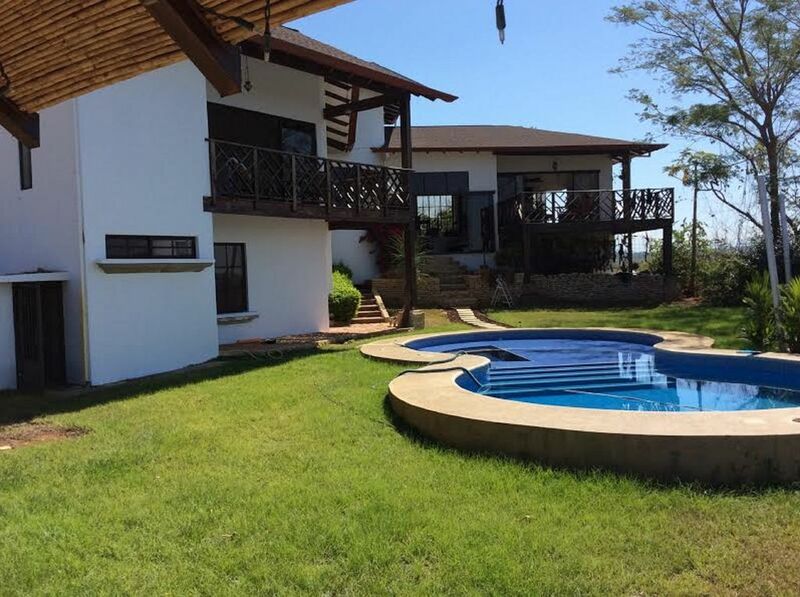 The safe neighborhood consists of Costa Rican homes and farms for a PURA VIDA contact with Costa Rica. _There is a bus service to the door for less than $ 1 in the heart of Puntarenas, the capital of the province of the same name, located 15 kilometers away and with all the amenities: hospitals, health services, banks, ATMs, supermarkets, port, etc. Interamericana, served by buses from all over the country and borders. A taxi service also serves "Cruce Barranca". It costs less than 1,100 colones (less than $ 2 to get to Quinta SOLYMAR. Duber Quiros of Liberia (LIR). _The capital, San José, with its modern and historical neighborhoods, populated by its 2 million inhabitants. Indeed, because of its location, Quinta SOLYMAR is an excellent pied-à-terre, as it allows access to most of Costa Rica's attractions, making the return trip on the same day. You can alternate between intense days and relaxed days. _ Ports of embarkation of Puntarenas (15 km_In catamaran, go to Isla Tortuga to dive and swim among the tropical fishes. _ Give yourself a mini cruise to San Lucas Island and visit the famous historical prison. _ And why not a relaxing return trip from the Gulf of Nicoya to one of the two ferries? Need an adrenaline rush? There are canopies in various adventure parks, including Adventure Park-Miramar (20 km) famous for its longest zipline in the country, with spectacular views of the Gulf of Nicoya, in addition to mountain biking opportunities , hiking, or even climbing. _ For a relaxing day: Visit an orchid farm (25 km), or a coffee cooperative in Naranjo (50 km). _ Need a dream expedition: Los Sueños allows you to practice golf, surfing, rafting, fishing, or, why not, paragliding! _ Want a memorable meeting with the Costa Rican fauna? In close proximity: _ Call the monkeys in the mountains of Caldera (15 km), and participate in their feast! _ Sanctuaries of Lapas (22 km), refuge of animals. A site most popular by visitors. _ Located in La Garita (65 km) ZOO AVE, another animal refuge and VIVERO CENTRAL, Garden Center, for horticultural lovers. _ The PAZ Waterfall Gardens Nature Park (115 km) will delight you. Around 10.00 am, take in the freshness of the morning the 3. 5 km of paved paths leading you to 5 pretty "cataratas" (falls), of the rain forest. One is 120 feet high! A shuttle brings you back to the main entrance just in time to enjoy a delicious buffet at "Restaurante Colibries". Then take a tour of the gardens, and their many attractions: _ Lago de truchas (trout lake) and observe them under the fall! _ AVARIO: It is a garden of exotic and colorful birds of Costa Rica that you can observe with the naked eye. _ MARIPOSAS: observatory of butterflies (life cycles and metamorphosis) with more than 20 species living in a natural habitat under structure._MONOS (monkeys): among others: spider monkeys and capuchin monkeys (cara blanca). _Garden Garden: the only place in the world where 26 species of hummingbirds are found. SERPIENTES: An exhibition that puts you face to face with the most famous snakes of Costa Rica. _RANARIO: walk and observe the frogs (nocturnal and poisonous frogs) in a natural place. FELINOS (felines) Ocelot, Caucel, Pumas, Jaguars and tigers. Around 15h00, departure for return to Quinta SOLYMAR. AND WHAT TO SAY OF BEACHES? _PLAYA DONA ANA (7 km), excellent beach in the countryside with picnic table under the trees, bbq, public toilets. At the end of the week there is a restaurant service. Parking 1,000 Colones, + minimal entry cost. (golden age discount). And again: Boca Barranca, Playa Caldera, Malpaís, Santa Theresa, Coyote, Manzanillo, Montezuma, etc. We prefer to let our guests enjoy their independence, but we remain available for any assistance. Our greatest satisfaction is to see you delighted with your stay and to read your testimonials of appreciations that you will want to have the kindness to leave us in our Album "souvenirs". We are able to inform you and assist you in your search for sites of interest. We also have information documents, and can make recommendations according to your tastes. If you wish to rent a vehicle, we can suggest a responsible agency, and assist you if required. If necessary, we can collect or return you to your airport, or accompany you during your visits. The language of use in Costa Rica is Spanish, and English is spoken in "some" tourist establishments. As in Quebec, TICOS and TICAS (Costa Ricans) appreciate the respect you give them by speaking their language, and they will do their hands and feet to help you. Feel free to be without embarrassment ... we can not learn without making mistakes! Time difference: during the summer in Qc, it is 2h earlier in Costa Rica (Winter is 1h). Private bathroom with washbasin, toilet, ceramic shower and window. We were looking for a nice, private and quiet place. We found it. My family and me had a very good time here. Owner is a very kind man. Near to many facilities if you want some good food or adventure. Gracias Adriana, Luis, y las chicas ! Realmente estaba un placer tener invitados tan amables y respetuosos. Cuando quieres regresar, será un placer de recibir ustedes !